Don't worry I'm not looking for a new kitten my two little munchkins are keeping my hands pretty full currently. I was wondering when I was taking to Griff and Arya's breeder the other day I asked if she'd ever bred a Cashmere Bengal. She said she hadn't and she's been breeding them since 1999 although she's bred a melanistic, blues, sepia and this really pretty seal mink sheated marble boy who looked almost Toritie with how his markings where in places (really pretty kitty) amoungst other different colours which just showed up when she was breeding for silvers, I'm not sure if she has thrown any smokes or charcoals I forgot to ask. 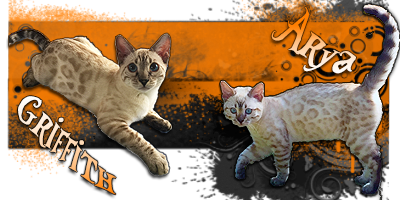 Anyway it got me thinking has anyone on the forum got a cashmere Bengal? Or know of anyone who's trying to breed them? In the future and I mean distant future I wouldn't mind a silver snow cashmere basically a longcoated version of my Griffith. In my surfing for F-generations, I've encountered a lot of websites. I just can't recall many of them. A quick Google search will point you in the right direction. Glad your little ones are settling in. Welcome to the forum. Posting pictures is easy. 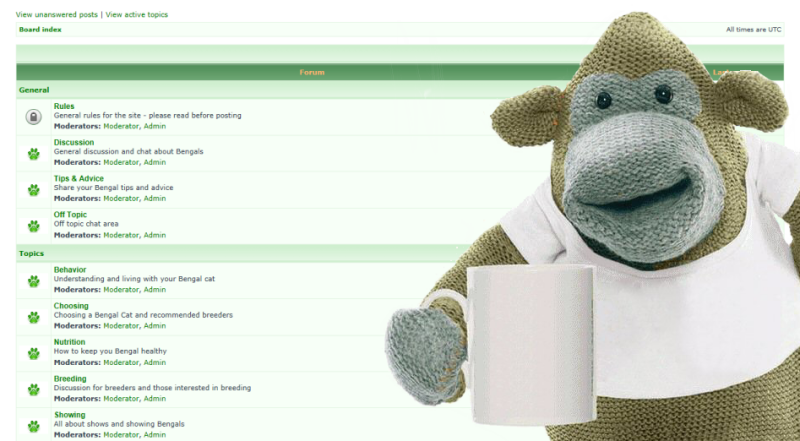 Scroll down past your posting box to the green bar that says "upload attachment." Hit "Choose file." Find the picture on your computer. Click "add the file". As long as the picture is under 256k, it will upload and appear in your post. Another way to do it is to have a public photo sharing website and just post a link for us to click on. Would love to see your fur babies. I'd definitely love to see pictures of, and hear about your Cashmere! Those are very rare cats. Let me know if you need help posting the pictures. It's not necessarily intuitive. viewtopic.php?f=11&t=3130 <--- this post might help you post photos. I would love to see your cashmere I've been super interested in them as kinda obvious with me starting the thread lol. I think people get the impression a long-haired or cashmere Bengal has long hair like the Norwegian Forest or Persian cats and that is not the case. The fur is just slightly longer than a normal bengal. Really gorgeous cat haha you may have just made me want a cashmere more. I've always really liked Somali's and Cashmere's are similar coat length wise. I've had friends with Persians and ragdolls and I honestly couldn't cope with that much fur but cashmere's seem quite manageable. It's nice that people are finally starting to try and standardise them and create their own breed, which also should make it easier for me to get one in the future hehe. I was expecting more Somali or Balinese considering the Foreign grouping bengals fall into when showing and the breeds used to create Bengals. The breeds come from a warmer climate so I think most who come from Asia or North Africa tend to be semi long, I remember when I was backpacking in Thailand 17 years ago (damn I feel old) and I was out on one of the islands around Krabi and I saw feral semi long haired pointed cats, along with what looked like old type Siamese. The kittens used to follow me around at sunset and sit with me on the beach, they where so cute and I guess since then I've always considered maybe getting a semi long haired cat as I've always had smooth coats previously. I actually thought more of getting a Somali though as I'm not the biggest fan of the current look on Siamese, they are just too angular now and the same with Balinese. Although when I actually got back because I wanted to bring one of the kittens back and obviously couldn't my partner at the time bought me Mina who was my first Bengal. She reminded me of my time in Thailand as I saw some Asian Leopard cats (sadly at one of the markets there) and a wild clouded leopard (which was probably the most beautiful creature I had ever seen) and I also wanted to see wild Tigers and Indochinese leopards but sadly that didn't happen. Also as she was a snow her Aqua blue eyes reminded me of all the kittens I'd spent time with over there. I'm hoping to go back at some point though and maybe I'll get to finally see that wild Tiger, just with my hip and back skeletal issues for the past few years it hasn't been possible to really go back. Also isn't the modern Persian more of a European and American creation as the original breed never had anywhere near as much fur as they do today. I've had friends with ragdolls and Persians and I really couldn't handle that much fur, my friend was always having to groom her Persian thankfully she liked being groomed lol, I like that Cashere's are more semi long with a bushy tail.